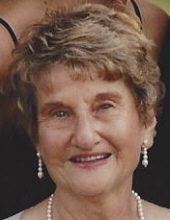 MacDonald, Viola E. - Age 92, of Clio, died March 19, 2019. Funeral mass will be held 11AM Saturday March 23 at Holy Redeemer Catholic Church. Father Steve Anderson celebrant. Visitation will be held 11AM-2PM and 4PM-8PM Friday with a 7PM Rosary being prayed. Visitation will also be held 10AM until time of mass at the church. In lieu of flowers memorial contributions may be made to the North End Soup Kitchen or Heart Beat of Flint. Viola was born November 24, 1926 in Riley Township, Mi. the daughter of Otto and Margaret Fedewa. She completed her education at St. Mary's School in Westphalia graduating in 1944. Viola then moved to Lansing in order to seek employment at General Motors as a secretary which she did for eight years. In 1953 she moved to Flint after her marriage to Kenneth MacDonald and was employed at Ternsted and eventually retired to raise her family. "Vi" (as she was known by all her family and friends) then turned to volunteering at her church and Holy Redeemer School, also the soup kitchen. She enjoyed sports, especially golfing with her family and watching basketball (the Spartans) and baseball (the Tigers). Viola was a member of Holy Redeemer Church, the HR Council of Catholic Women, Catholic Council on Aging, Heartbeat of Flint, and St. Martins Guild. Vi is survived by her five children: Randall (Andrea) Macdonald, Kathy (John) Burris, Mary (Vince) Black, Anne (Blake) Rizzo, Lynn (Chris) Ridella; 13 grandchildren: Ryan, (Carly) MacDonald, James and his husband Kal MacDonald, Dana (Nate) Wakefield, Kristin, Gina (Aaron) Synor, Taylor (Marla) Allie, Sam Black, Ava, Myah, and Ella Rizzo, Cameron and Mallory Ridella; 8 great-grandchildren; brother: Stan Fedowa; sisters: Sally Kramer, Janie (Carl) Bowman; sister-in-law: Rosie Fedewa; many nieces and nephews. She was preceded in death by her husband: Kenneth; parents Otto and Margaret Fedewa; sisters: Marcella Pierce, Isabel Bachman; brother: Hilary Fedewa; and many close family and friends. The family would like to extend a special thank you to Gross Assisted Living and Absolute Hospice staff who took great care of our mother. Online tributes may be shared on the obituaries page of www.sharpfuneralhomes.com. To send flowers or a remembrance gift to the family of Viola E. MacDonald, please visit our Tribute Store. "Email Address" would like to share the life celebration of Viola E. MacDonald. Click on the "link" to go to share a favorite memory or leave a condolence message for the family.